Anna Friz began making radio as a volunteer programmer on campus/community radio CiTR Vancouver in 1993. 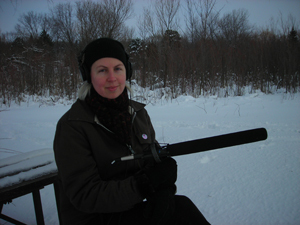 Since then she has created audio art and radiophonic works for extensive international broadcast, installation, or performance in more than 30 countries, where radio is the source, subject, and medium of the work. She also composes multi-channel atmospheric sound works for theatre, dance, film installation, and solo performance that are equally able to reflect upon public media culture or to reveal political and interior landscapes. Anna holds a Ph.D. in Communication and Culture from York University, Toronto and is Assistant Professor of Sound in the Film and Digital Media Department of University of California, Santa Cruz. She is a steering member of the artist collective Skálar | Sound Art | Experimental Music based in East Iceland and a long time affiliate artist of Wave Farm (formerly free103point9) in Acra, New York. Anna is an itinerant member of the Toronto-based art collective Public Studio, which together recently completed a City of Toronto commission for a new permanent public sound installation 120 Mirrors in the Lee Lifeson Arts Park in Toronto. In 2016 she was a co-curator of the Radio Revolten International Radio Art Festival in Halle (Saale) Germany. 24. 06. 1999: "I am the one who says: here I am"
28. 11. 1999: "I am the one who says: here I am II "
19. 12. 1999: "Silence descends"
23. 01. 2000: "Radiokunst aus Canada"
10. 02. 2002: FREQUENCity - "The Clandestine Transmissions of Pirate Jenny"
14. 07. 2002: "Central Dispatch"
21. 08. 2011: „Kanadische Radiokunst heute"
28. 08. 2011: „Radioarbeiten von Anna Friz"
20. 01. 2013: “Art's Birhtday Review"